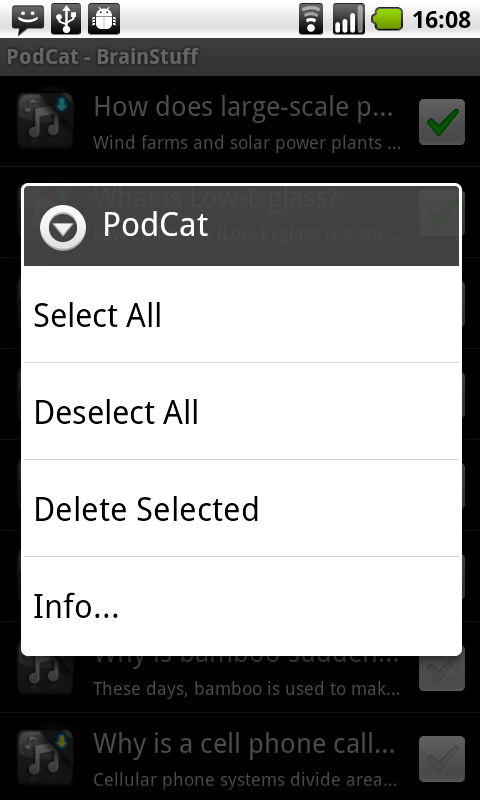 PodCat provides functions through options menu, context menus (short press, long press). You can see next screen after you successfully launched the app. 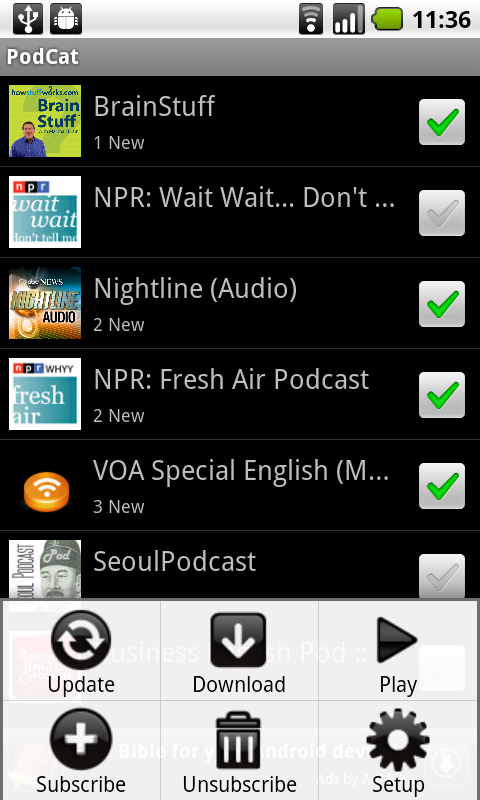 In the main screen, subscribed podcast channels are listed, by short press you can enter to the item list screen. By long press you can see context menu like picture below. Followings are explanation of context menu items. Select all items in all channels which are not listened by the user until that time. Only audio files can be selected all other types are ignored. Select all items below in all channels. Deselect all items below in all channels. Delete selected items in all channels. It is different from unsubscribe channel. It will just delete downloaded files and make that item downloadable state or if that item was obsolete state item itself also will be deleted from the list. Move up the channel a notch in the list, so that the order of channels changed. 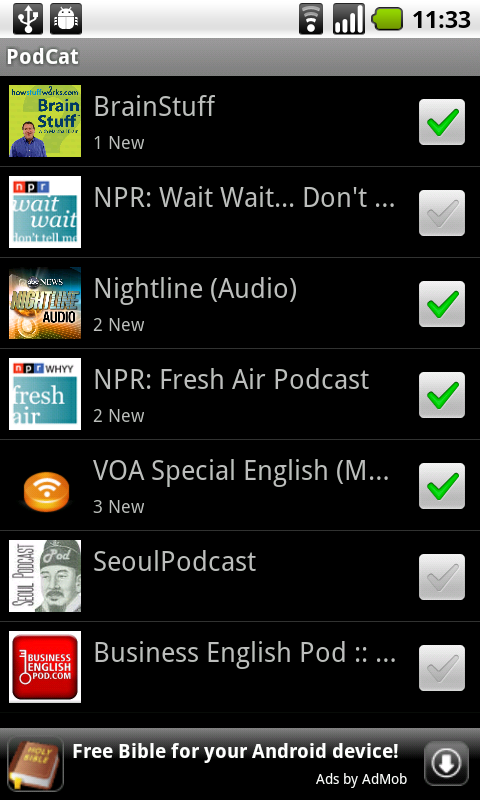 Move down the channel a notch in the list, so that the order of channels changed. View detailed information about the selected channel. Next screen is from the file list. 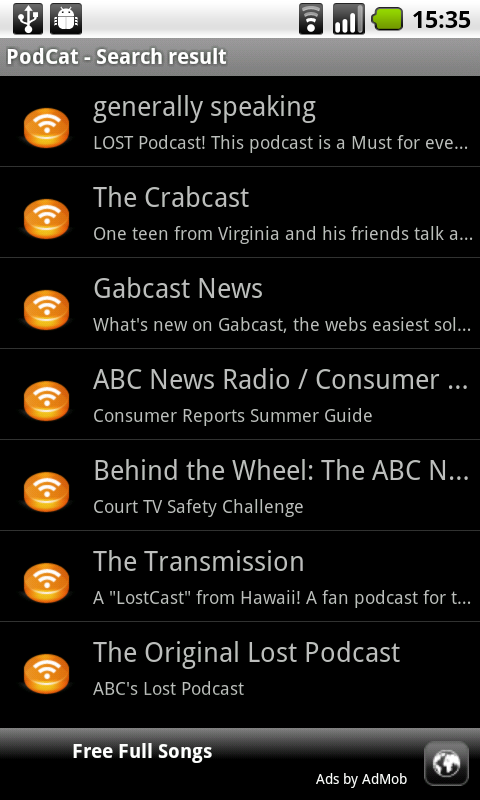 The file list is representing file on the podcast server now. On the left there is a icon stands for file type and its state. Once a file has been downloaded you can see a context menu like center picture above from there you can play the file individually or make it listened/unlistened state. Long press enables you to popup a context menu like right picture above. Delete selected just downloaded delete file not the list item from the list. on pressing menu key following options menu will be shown. Looking for new items in podcast server. the time is compared to last time you updated or subscribed a channel. When new articles are detected, number of new items appears at the bottom of title and automatically checked to be able to download. There are times when the update process fails due to network problems then you can simply retry by pressing the button again. 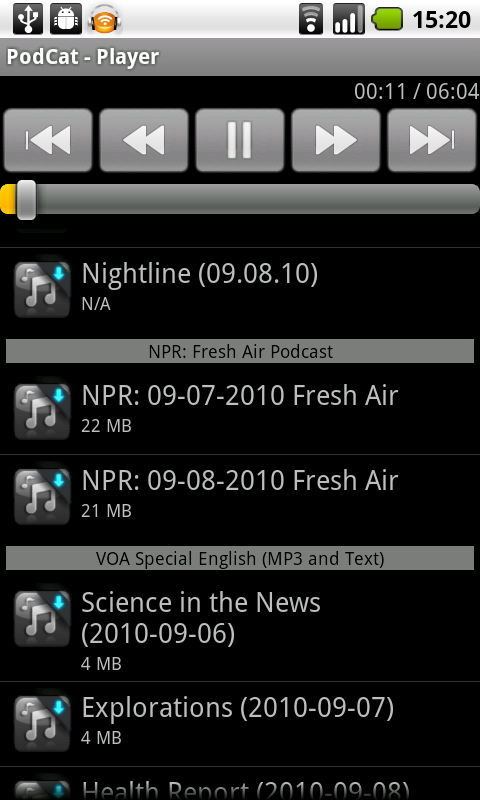 After you have checked channels or items in each channel, download those files with the menu. screen will be changed to download screen and you can skip current download or see information about downloading item by context menu (long press) of the item. On the far right picture, when you press back button while downloading a popup dialog appears asking you for terminate download. 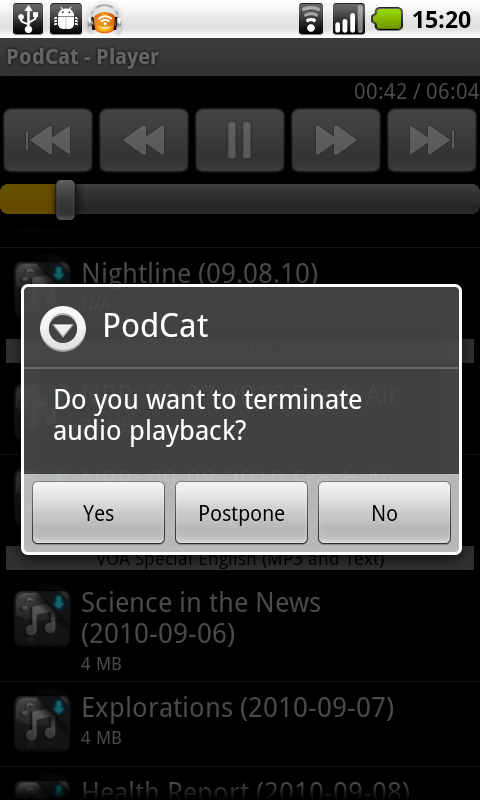 Yes means terminate current download completely do not resume next time from the point download was reached. Postpone means download can be resumed next time. It won't delete partial file so that download can be continued from that point on. The checks on each item will remain after downloads are finished, then you can touch back button to go main screen and again in options menu touch to play downloaded items. while playing you can multitask another apps by pressing home button rather than back button. 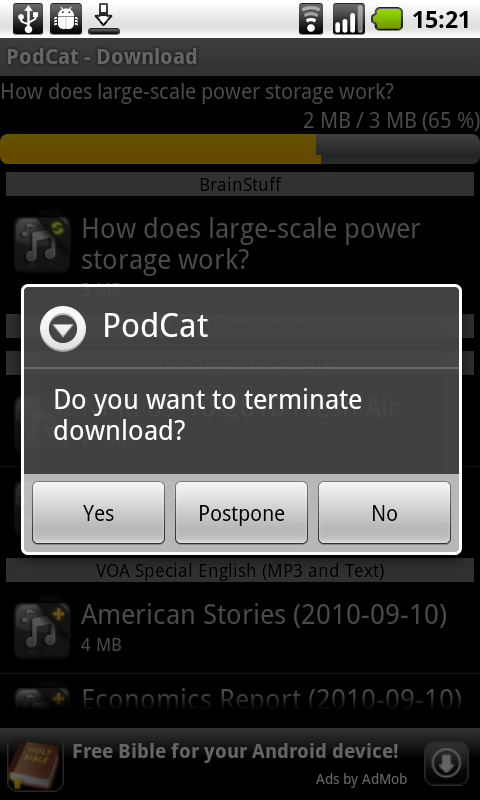 Back button will show popup which has the same meaning you see terminating download screen. Context menu shows play and info button. To make a mp3 file unlistened, the file must be played to the end, skipping to other file will not change its state, or you can make it listened at the file list menu as explained above. 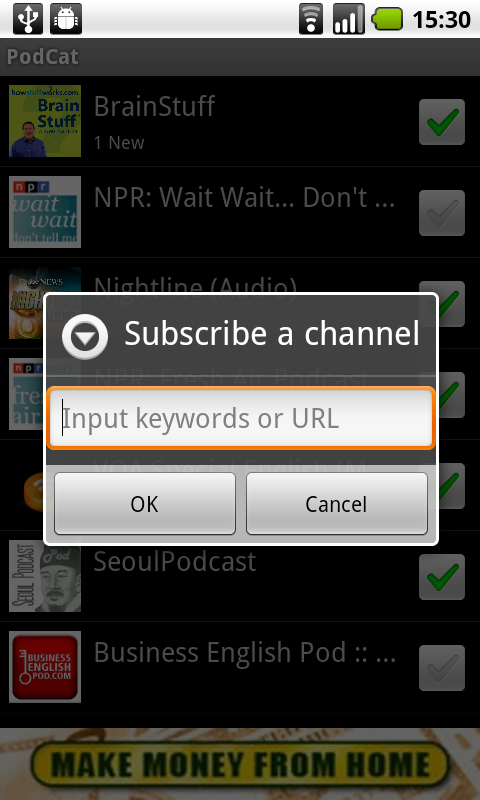 To subscribe a channel, you can enter keywords or URL of specific podcast. 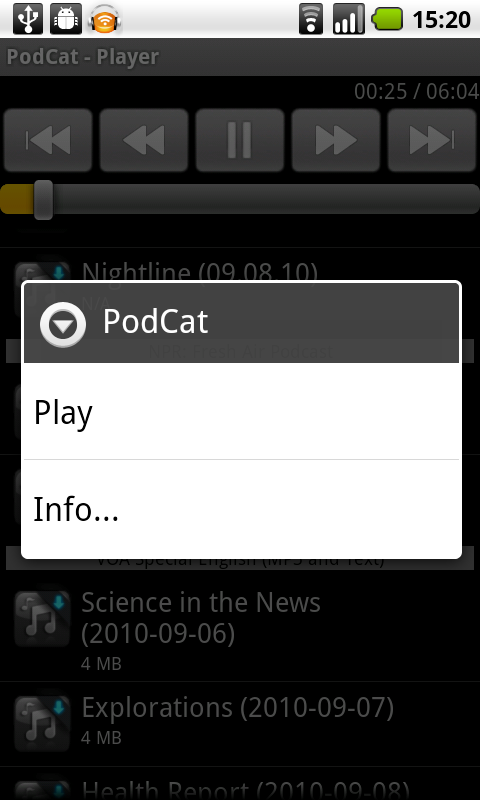 When you enter keywords, podcat will search up podcast search service and return result channel list like the picture above. Then you can list up and subscribe a channel or see details through context menu of each item. If you touch unsubscribe menu, all the checked channels are unsubscribed and all the belonged files are also deleted after a confirmation notice. Download can be done only in WIFI connection state if this is checked. 3G connection can be very costly if you download with it. Remind carefully using this menu. 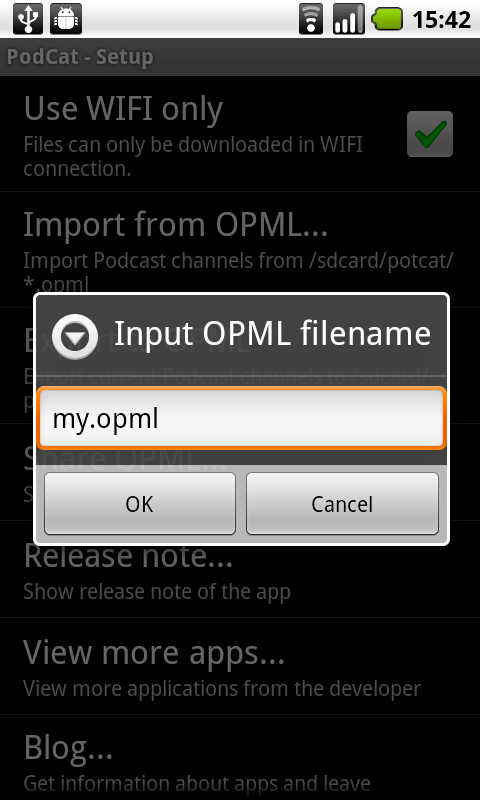 OPML is a xml file which describe podcast channel list. You can import channel list which other people made in advance. 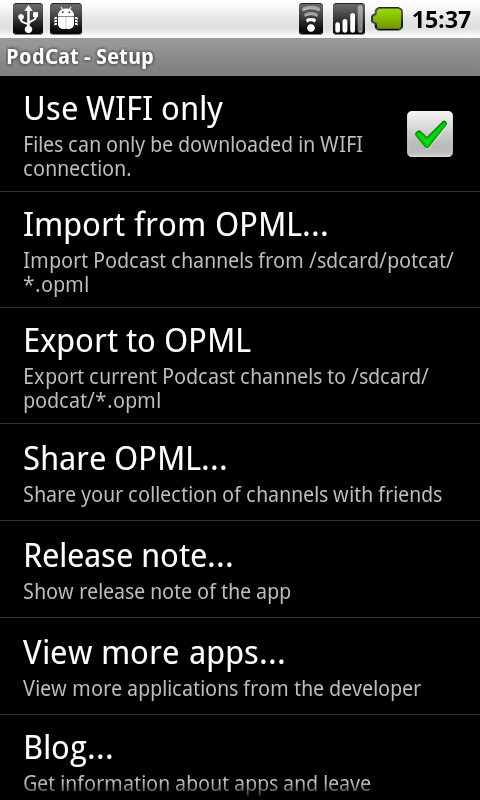 Podcat will search files have .OPML extension below the /sdcard/PodCat folder only. After you enter appropriate filename for a new OPML file. Current your subscribed list will be saved at the file. First you will select which OPML file to share and the picture like above right would appear. 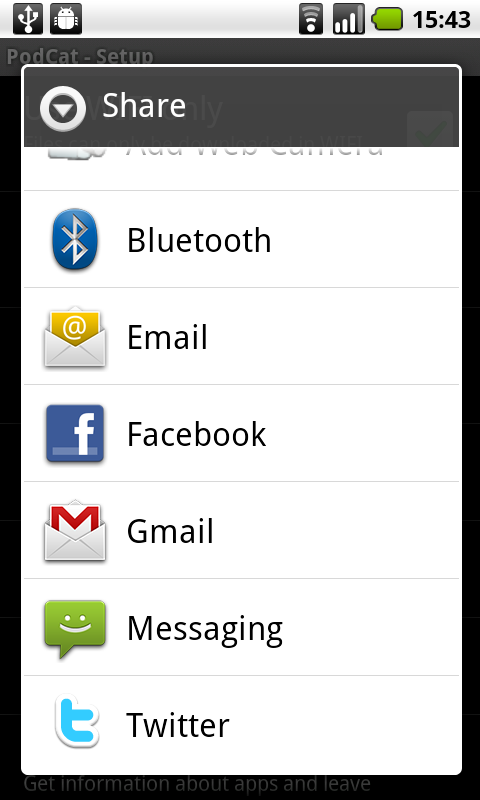 Some of the menus on the share might not work for you but it depends on devices and installed apps. These are information about this app and developer. 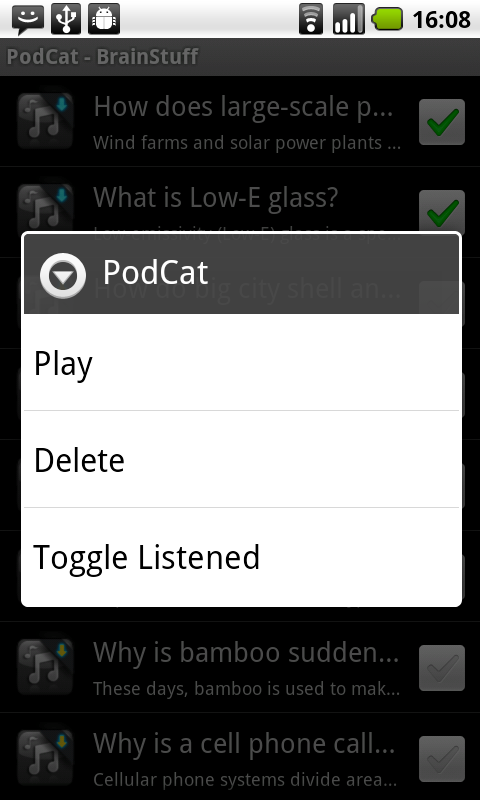 Next icon scheme will be used throughout PodCat, file list, play list, download list. 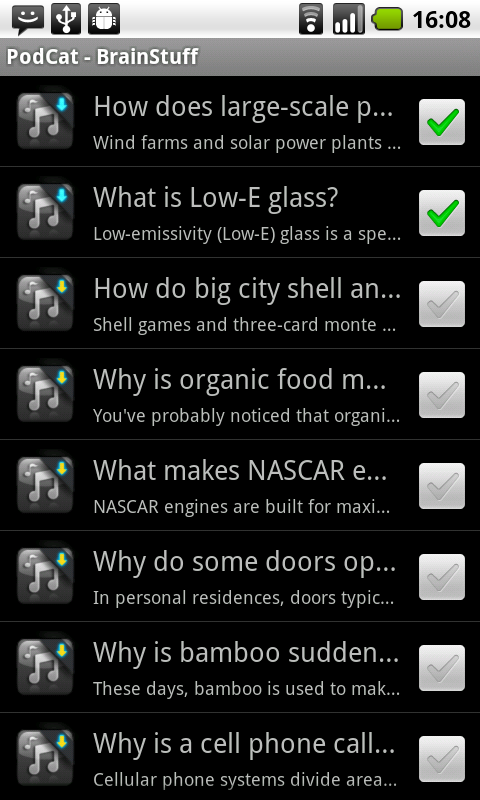 above 3 icons represent file types mp3, video, pdf or etc respectively. 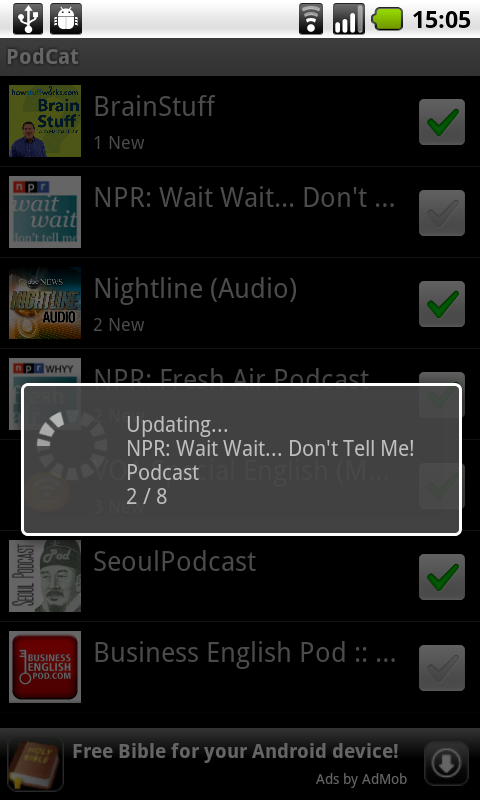 This icon means downloaded and listened mp3 file. This icon means currently downloading file. This icon means downloaded and not listened yet. This icon means obsolete file downloaded locally but removed from the server.